and the power to ruin her if she refuses to play his loving fiancée! But returning to the world stage revives Olivia's old demons, and instead of walking down the aisle toward her gorgeous groom-she flees! The world holds its breath: Can the indomitable Rocco get his wayward bride to the altar on time? 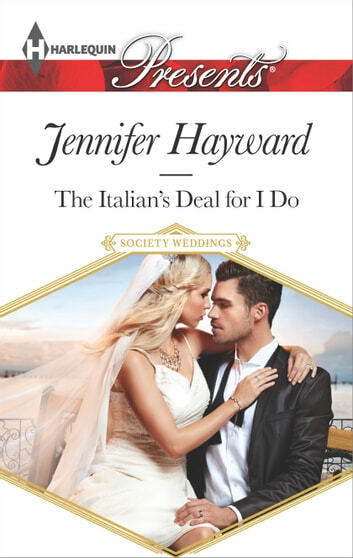 The Italian's Deal for I Do by Jennifer Hayward consists of a world that is built on secrets and lies. Rocco is used to getting everything he wants. He relishes on having control. After his grandfather dies, Rocco begins to realize things are not as they seem. Rocco feels blindsided to discover that in order to maintain control of the company he has worked to make prosperous he must change his public image. In other words he must settle down. He believes he has found the perfect candidate when he discovers another secret his late grandfather had been keeping. Former supermodel Olivia has been hiding out with the help of his grandfather. Rocco blackmails Olivia. Along the way they end up falling in love. Received a copy of this book for an honest review. This is a story about discovering what's most important and living up to your dreams. This was definitely a sweet story of family, love, betrayal, friendship and how love mends broken hearts and connects one heart to another.